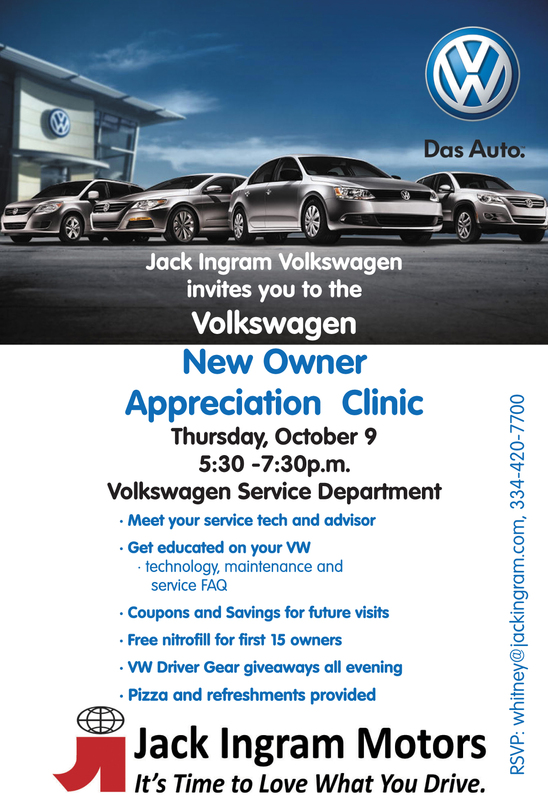 Join us Thursday, October 9th, for our fourth Jack Ingram Volkswagen New Owner Service Clinic at the Jack Ingram Volkswagen Service Department. We invite all new VW owners to attend the event and have one-on-one time with your service advisor and Volkswagen technician. Do you have questions about operating your new Volkswagen? Our VW service department has the answer! We can help you get acquainted with your new vehicle and learn how to turn on/off maintenance reminders, setup your bluetooth, turn off service lights, reset info on your dashboard, answer questions about your maintenance and service contracts, and treat you to dinner. We will provide VW prizes and dinner to everyone who attends. We look forward to seeing you this Thursday at the Volkswagen service department. The clinic starts at 5:30p.m. and is come and go, so please feel free to stop by even if you can’t stay long. It’s Friday! The weather in Montgomery is gorgeous and it looks like it is gearing up to be a beautiful Alabama weekend. We thought we would share this tid-bit of humor with you, after all if is Friday so why not start the day off with a good laugh to make it that much better. 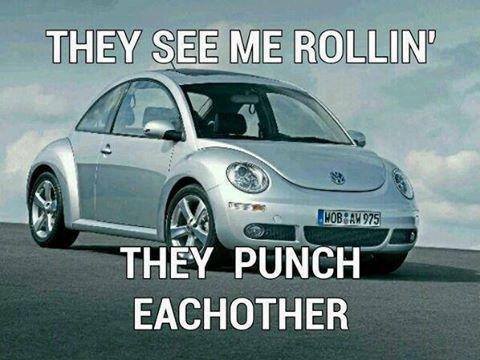 Who used to play the punch buggy game in their Volkswagen Beetle? We did! Good times that bring good memories. That’s one of the great things about the Volkswagen brand, the models are so timeless and you associate lots of special memories and moments in your life with your vehicle. At Jack Ingram Volkswagen, we strive to give you that same buying and owner experience every time you do business with us. We want you to love your VW and create memories you will cherish forever in your new or used Volkswagen. A trip to the beach, family vacations, random road trips, punch buggy games, with Volkswagen there is always an opportunity to be creative. After all it is the trendiest brand on the market right now! Visit us at Jack Ingram Volkswagen in Montgomery for all your sales and service needs. The Harlem Shake is so contagious that even Jack Ingram Motors is catching it! Jack Ingram Volkswagen in Montgomery, Alabama created a Harlem Shake video this week! The Volkswagen sales and service staff break it down and show us their moves. Here is Jack Ingram’s version of the Harlem Shake. As you can see, we are all about fun! Volkswagen of America has made a name for itself when it comes to “over the top” commercials. We all remember clearly The Darth Vader Passat commercial that won several awards making it one of the top commercials ever produced. It premiered in the 2011 Super Bowl. Other VW commercials like “The Clap” highlighting the Volkswagen Beetle and “The Dog Strikes Back” are also a favorites. This year’s 2013 Super Bowl featured the Volkswagen Beetle, with “Get in. Get Happy,” a spin on having a case of the Monday’s for the average worker. Once the co-workers hopped in their new Beetle, they were extremely happy and giving off a contagious smile that cuaght on quickly throughout the office. The list goes on for Volkswagen, who does a great job of setting itself apart in the automobile industry when it comes to brand advertising and the power of German engineering. Recently, Volkswagen released a new commercial, “The Mask.” We took a poll at Jack Ingram Volkswagen in Montgomery, Alabama and all agree that this just might top our list of favorites. We would love to hear your thoughts. What do you think of the lastest commercial highlighting the all-new 2013 Beetle Convertible? We think Volkswagen got it right this time!